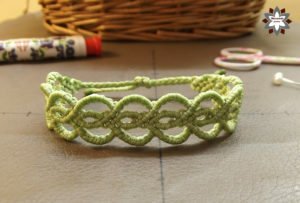 This is a simple heart pattern bracelet tutorial. It is a basic pattern, which is very useful to have in your armory. 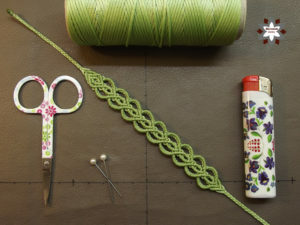 You can add this to your necklaces or even to your earrings. You can upgrade it to double heart pattern or more. It is spectacular and not so complex, the steps are repeated, if you get stuck go back to the first steps and that will help to understand the steps. 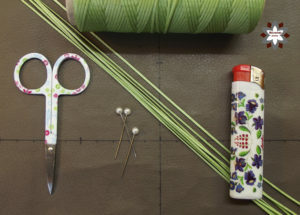 Please look around macramotiv.com and discover other micro-macrame photo tutorials. I found the bug which caused the problem with loading all the thumbnail images. I managed to fix it. From now all the images are shown in each photo tutorial, and you can click on them to see them in larger scale, and there you can use the left/right arrows to see the previous/next images. Is there a PDF available please? The tutorial only goes so far before a “load more” icon, yet it won’t open anything. I don’t have a pdf version for this. I will look at the problem and I hope I can fix it somehow.